Racing resumes at Los Al today after an incredibly tragic day yesterday due to the wildfires spreading to San Luis Rey Downs. Many heroes and many backside workers are still in need. Please check twitter for information on helping. At Los Al, we have a Grade 1 affair for 2 year olds. The downside? Only 5 runners will go postward. The upside? It’s part of the Pick 5, where smaller fields have a way to turn into bigger payments. 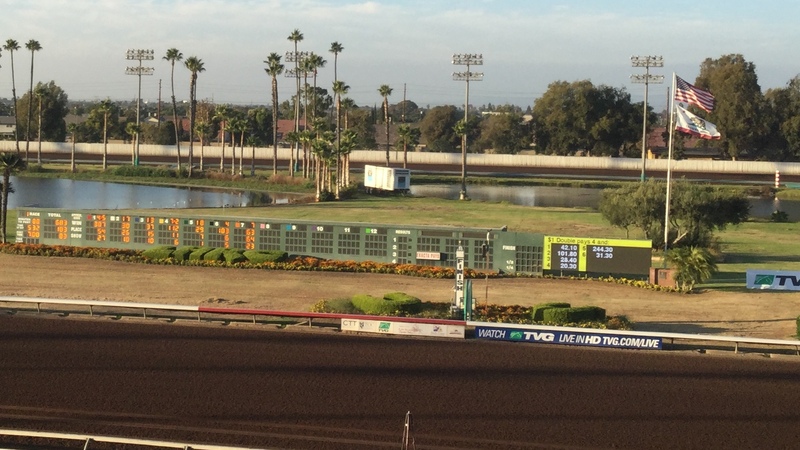 The race is 8.5 furlongs and on dirt — and with 2 strong Baffert favorites. You can use the race as a “free square,” or perhaps, try to beat them and turn the P5 in your direction. For Him: A maiden claiming winner who ran well on the turf in the Zuma Beach, he’ll likely find his way back to dirt eventually. He has some stamina in him — something that plays well on the Los Al surface and down its stretch — but it likely won’t be enough for him to be a contender here today. Solomini: The first real contender and the first Baffert entrant who wil be ridden by Flavien Prat. Ran 2nd in the Breeders’ Cup Juvenile and he’s established himself as a top-flight router. The 2 seconds aren’t seconditis, but instead a result of just not being fast enough. He finished ahead of Bolt D’Oro, the current Kentucky Derby favorite in the Juvenile. He’s a serious horse and it would be hard to leave him off any ticket — large or small. Runaway Ghost: Broke his maiden in the early June at Santa Anita and then reappeared in a stake at Golden Gate Fields. He won that stake by 7, but his time was average, and it was a sprint. He’ll be first-time routing today. He might be a bit of an X factor — a horse that won off the layoff, won a speedball sprint in the spring, and still has to show us what he can do in a route. He’s a possibility with the Bafferts or to include as an upset. McKinzie: The other Baffert ridden by Smith and is likely to be the favorite. He goes from maiden to G1, a tough jump at any age, although easier in these 2YO/3YO races on the Derby trail. He dominated a 7 furlong maiden sprint with a very impressive speed figure and now adds the extra 1.5 furlongs as he tries routing and two turns. He’s been blowing it up in the morning. He’s hard to leave offf a ticket, although there are risks — first time route, huge class jump — which might signal some value if left off. Analysis: I’m going to stay away from the impressive maiden winner McKinzie and instead look at Solomini or Runaway Ghost to have a great through. For Him is good for the up-the-track spots in the exacta and trifecta. Good luck at the races.